A newly discovered dinosaur named Dreadnoughtus schrani has laid claim to the title of world's largest terrestrial animal, thanks to the recovery of its "exceptionally complete" remains from Southern Patagonia, Argentina. And what better way to introduce you to this colossal creature than with cold, hard metrics? Measurements taken from one of Dreadnoughtus' femurs, which stands over six feet tall, have led Lacovara and his team to estimate that the dinosaur, which lived approximately 77 million years ago, weighed about 65 tons in life, making it far and away the largest land animal for which a body mass can be accurately calculated (the previous record holder, another Patagonian titanosaur named Elaltitan, had a calculable weight of 47 tons.) No two ways about it – Dreadnoughtus was, to quote Lacovara, "astoundingly huge." Looking at a chart like this, it's easy to see why Lacovara's team opted to name the dinosaur Dreadnoughtus, which translates to "fears nothing." "I mean, this animal is nine times the weight of a T. rex," says Lacovara. That's a pretty incredible comparison, especially when you consider that analysis of the bones suggests this creature wasn't even finished growing. "At 65 tons, we expected this to be a pretty old individual," says Lacovara, "but that wasn't the case." In fact, he says, his teams measurements measurements suggest "this animal was still growing pretty rapidly" when it died. "We don't know of anything that could have preyed upon a full-grown, healthy Dreadnoughtus," he says. Even more significant than its size, however, is the completeness of the Dreadnoughtus specimen. "It's fun to find a big dinosaur and speculate over whether it was the biggest to ever walk the Earth," says Lacovara, "but what's really important is how informative the skeleton is." Above: The reconstructed skeleton and body silhouette appears in left lateral view, with preserved elements in white, surrounded by recovered bones. Skeletal reconstruction by L. Wright, with G. Schultz, via Lacovara et al. Lacovara and his colleagues estimate they've recovered about 45% of a complete Dreadnoughtus skeleton. That might not sound like a lot, but if you infer the existence of bones that are mirrored on the other side of the dinosaur's body, that figure is actually closer to 70%. 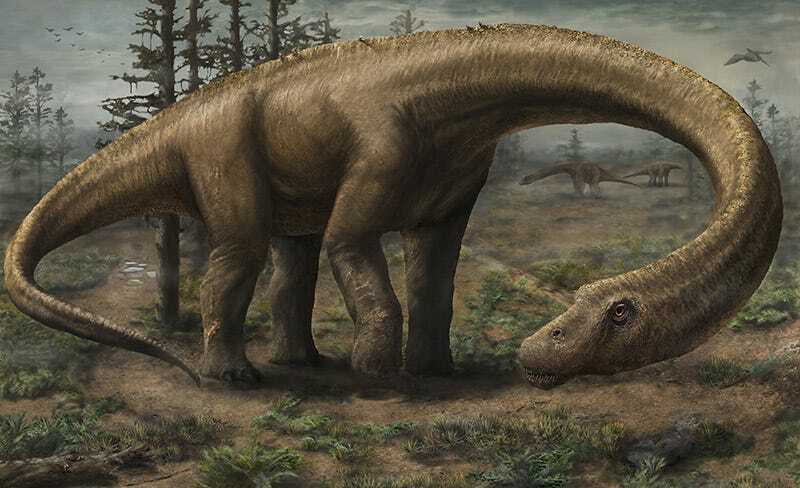 The most complete supermassive dinosaur specimen to be discovered prior to Dreadnoughtus belonged to another titanosaur named Futalognkosaurus, for which the same values were 15.2% and 26.8%, respectively. "This is a significant uptick," says Lacovara, "easily the most complete example we have of the most giant creatures to ever walk the planet." For instance, says Lacovara, when you find an animal this large, you expect it to be largely muscled as well, but Dreadnoughtus was brawny even beyond their expectations. "Even for its size," he says, "it has extremely large muscle attachments." Consider, for example, the chevrons, a pair of bones that hang beneath each of Dreadnoughtus' tail vertebrae. Normally, says Lacovara, chevrons taper to a narrow point to which some of the animal's "tail wagging" muscles can attach. You can generally gauge a muscle's power by the size of its attachments. In the case of Dreadnoughtus, the chevrons begin to taper, only to flare out into a huge area for muscle attachments that Lacovara says looks kind of like a spatula. Based on these these chevrons, his team hypothesizes Dreadnoughtus had an immensely powerful tail. "Any animal attempting to menace a Dreadnoughtus would have had this terrible weapon to contend with," says Lacovara. "This animal was just a beast." Lacovara's team's observations are published in the latest issue of Scientific Reports.